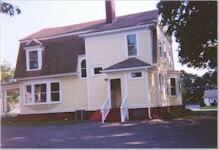 This is a picture of our building from sometime in the early 1900's. We think that the house was built in the late 1800s and used as the parsonage for the Second Congregational Church next door. After the parsonage moved in the early 1900s, the house remained as a single family residence until becoming our office in 1980. 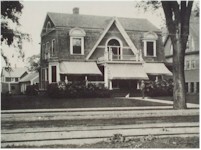 The awnings and the large tree in front are long gone as are the trolley tracks in North Main Street (the parallel lines in the foreground). Actually, it turns out that when the trolleys stopped running, the trolley tracks were simply paved over. 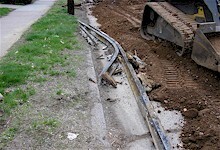 During construction of a recent gas line upgrade project, the long buried tracks were encountered and had to be cut away and removed from the work area. Those of you who have visited know that even though our address is 387 North Main Street, our driveway (and our parking area in the rear of the building) is actually off of Union Street. Being on a corner lot means that we have two sidewalks to remove snow from in the winter. Twice the fun! 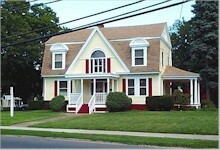 A view of our building from North Main Street. It gives us pause every now and then to think of all the other people who lived and visited in this house over the many years. Rooms that today are used as offices may at one time have been someone's bedroom.